"You eat with your eyes." Those words of wisdom from Chef Todd Bull, Food Service Chef in the Grossmont Union High School District. Bull has been a professional chef for years, and is a graduate of the famed "CIA" -- the Culinary Institute of America in New York. When it comes to making food for students, presentation is everything. "Doesn't look good? They're not going to try." On Thursday, the front lawn of Grossmont Union High School looked like a farmer's market. Students cruised outdoor booths, picking up fresh food for free. 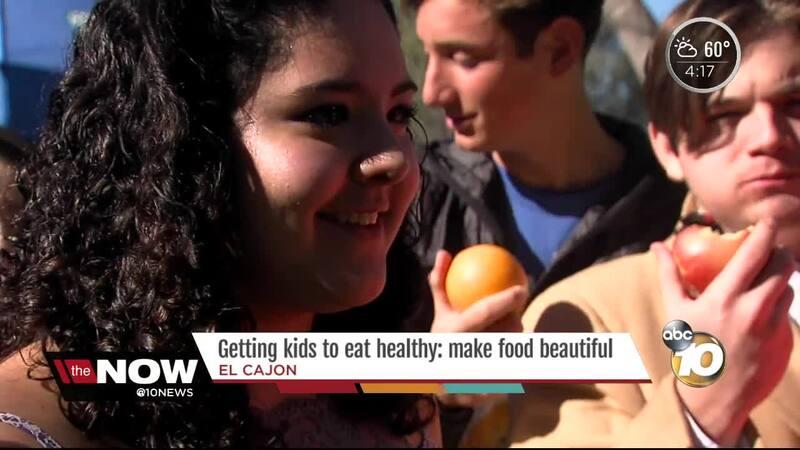 The school is expanding its "California Thursdays" program, a statewide program that serves California food to California students. "Super fresh! And organic as well," said Tarek Ayoub of the produce at his stand. He was handing out berry oranges from his son's farm, Eden Tropics in Temecula. Ayoub asked Chef Bull to cut up some of the oranges for display. Chef Bull used what's called a "crown cut" to give the oranges an edge. "I love those," said Grossmont High senior Priscilla Garcia of the food display. "If you cut food into fun shapes, little kids are more likely to eat it," she said. To be sure, fresh food is healthier. But is it cost effective for a school district? Food Service Director Vince Scimone said the food is a little more costly, but the district -- which serves thousands of students each day -- has great buying power. "We believe we're the largest restaurant in any backyard," he said.